The responsibilities of a university hospital are vast. It develops the existing and future NHS workforce, has the ability to make and apply scientific breakthroughs and deliver cutting-edge, evidenced-based care. To undertake this, university hospitals require strong and thoughtful leadership. This is the role of the chief executive, or CEO. University hospital CEOs are leaders of change. They are responsible for overseeing the organisation’s strategy and must understand every aspect of the trust. The leadership a CEO must embody is multi-faceted. As well as providing direction internally, they must do this on a national level by guiding innovation in the delivery of our healthcare. Fulfilling these expectations is a challenging task, which is why good leadership is fuelled by collaboration. CEOs will encourage leadership in all departments within a trust, ensuring that high-level decisions are based on collective expertise. This expertise is the basis of the University Hospital Association. 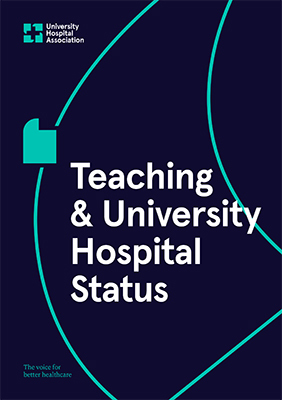 Through UHA, university hospital chief executives are able share their knowledge and experiences, learning from each other and forming a unified voice to tackle issues affecting healthcare delivery. The collaboration continues with further specialist groups in research and development, human resources, finance, nursing and medicine. Working together as part of the University Hospital Association, the UK’s leading hospitals form a powerful voice for better healthcare. The current Chair of UHA is Bob Bell, Chief Executive of Royal Brompton and Harefield NHS Foundation Trust.